Decoupage and Upcycle Old Clay Pots in Less than 30 minutes! So many of us are just longing for spring when we can get outside without freezing our batookies off and enjoy the wonderful weather. We just received a healthy dose of winter here in Missouri and I take that as an opportunity to get a jump on my spring garden crafts. This one of my most popular garden craft projects from my archives. 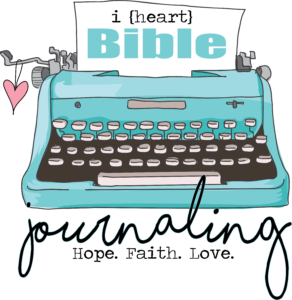 I love it for three reasons, it’s upcycling, it’s quick and it’s also about giving. What could be better? It’s so easy to decoupage and personally, I think decoupage is so under-rated. It’s the perfect craft technique to use when you want to give something a little extra personal touch! You can use decorative napkins, tissue paper, wrapping paper or even old dictionary paper to give your pot a decorative touch. 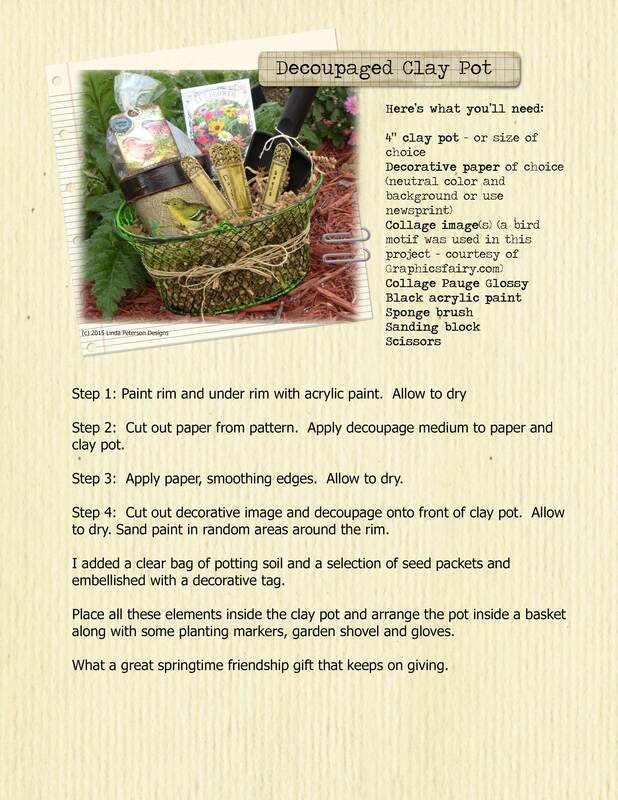 In addition to basic craft supplies you will need a basket, paper shreds, small shovel, seed packets of choice. Always apply a generous layer of decoupage medium to both surfaces you are going to adhere. One coat of decoupage medium to the front side of what you are applying the image to along with the back side of the image. I find it helpful when I decoupage to use my fingers to smooth out any bubbles. Apply an additional layer of decoupage medium once your project is finished to give it a shine and a good seal. Paint the rim of the clay pot with acrylic paint. Also paint the inside. Allow to dry. Cut out paper from pattern. (download pattern) Apply decoupage medium to paper and clay pot. Apply paper, smoothing edges. Allow to dry. Cut out decorative image and decoupage onto front of clay pot. Allow to dry. Sand paint in random areas around the rim. I added a bag of potting soil and seed packets to the inside of my clay planter. 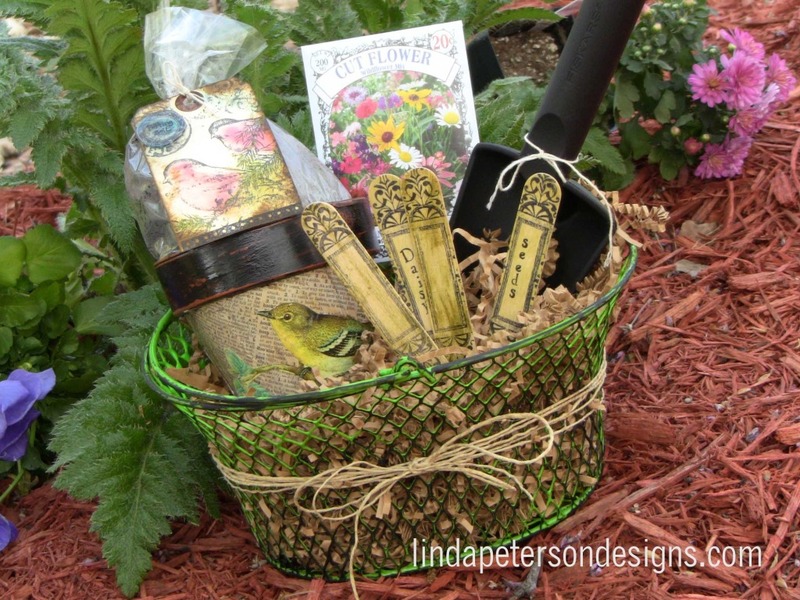 Then I set the planter and into a basket filled with other garden goodies, like a hand shovel and gardening gloves. Add a tag and you’re all set to give it to a friend. It’s the perfect garden gift that keeps on giving! I’m off to London on Friday to photograph my next book and I hope to be able to take some v-logs so you can join me on my journey. I’m so totally into my gardening projects right now and can’t wait until my flowers grow and blossom so I can take some pictures to share. Who knew gardening is comfort for the soul? It can relieve stress and has so many health benefits. If you’re new to gardening and don’t know where to start, here are some helpful resources I found at GroomandStyle.com. 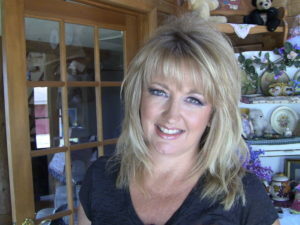 Kelli from GroomandStyle will help you determine what kind of garden you want to grow and the best place for it. In the meantime, I’ll just share some great ideas that I’ve found on pinterest that hopefully will inspire you to create and repurpose too as well as some of my favorite garden art videos. 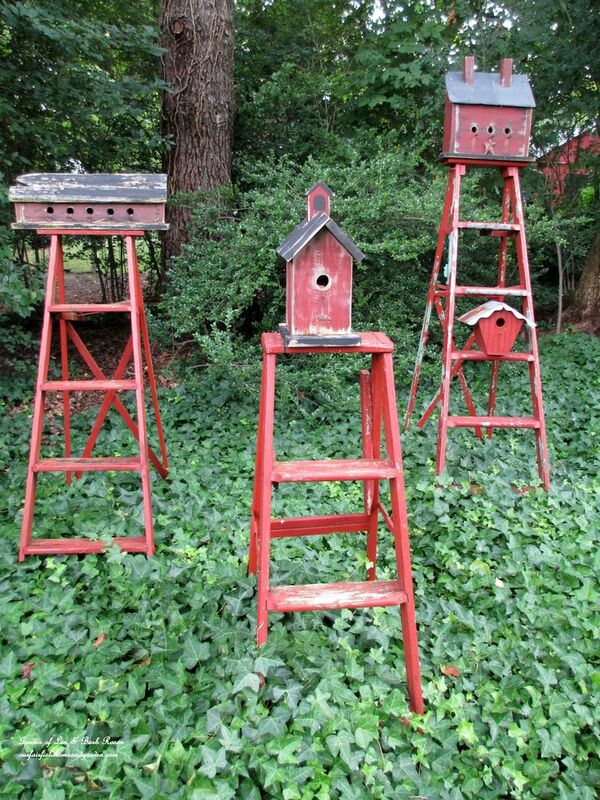 First up – I adore these birdhouses from Our Fairfield Home and Garden – so many ideas for birdhouses and more! 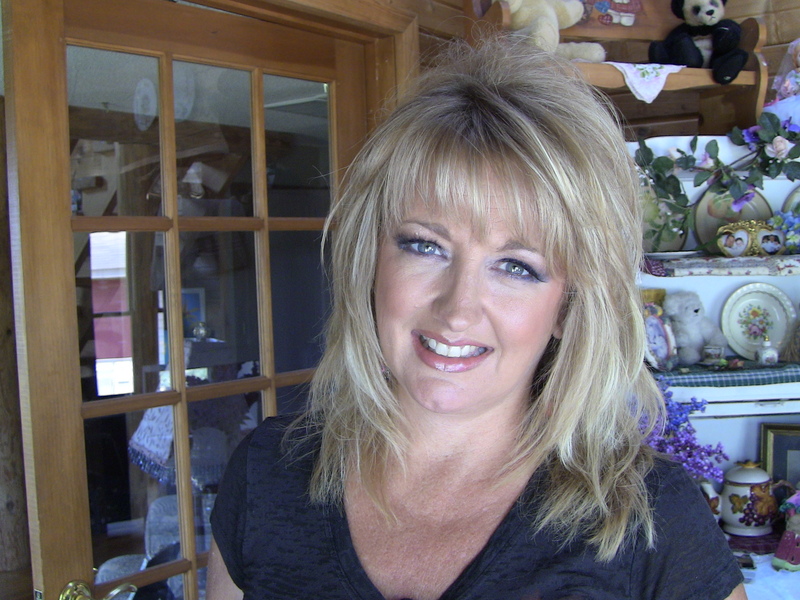 Did you see my hanging herb garden video? 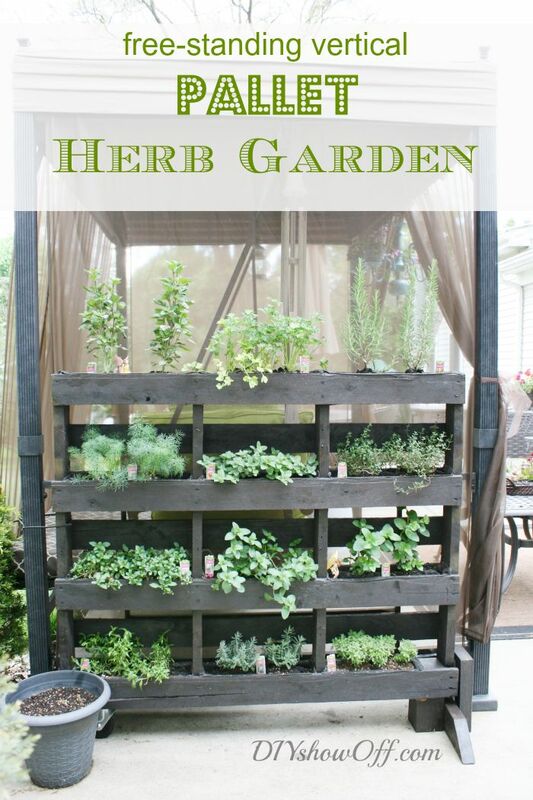 If you have a little more space – you can do make a pallet herb garden! What a great use of space and pallets are CHEAP! Diyshowoff.com gives you the tutorial to make it. 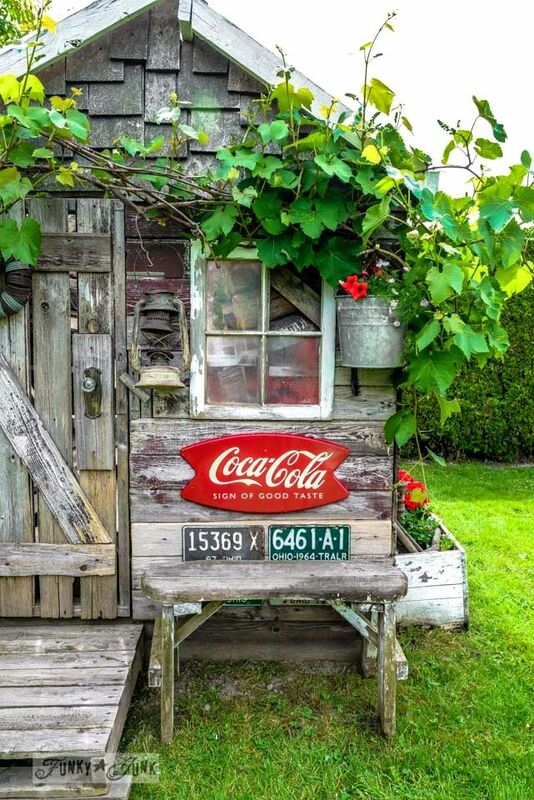 Donna at funkyjunkinteriors.net always has amazing ideas on how to repurpose old junk – I’m so in love with her junked out garden shed! 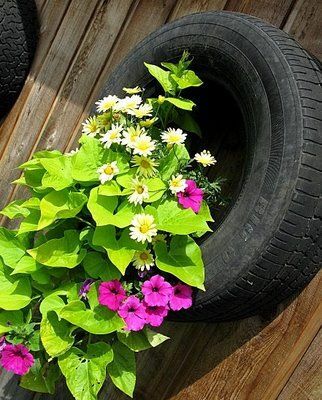 Another amazing find on funkyjunkinteriors.net – a great way to reuse old tires! Yes, I have one and I’ve got the perfect spot! And one more great find – perfect for a little nook in your garden. A mini birdbath! So easy with some clay pots and an old ladder, but oh how fun! 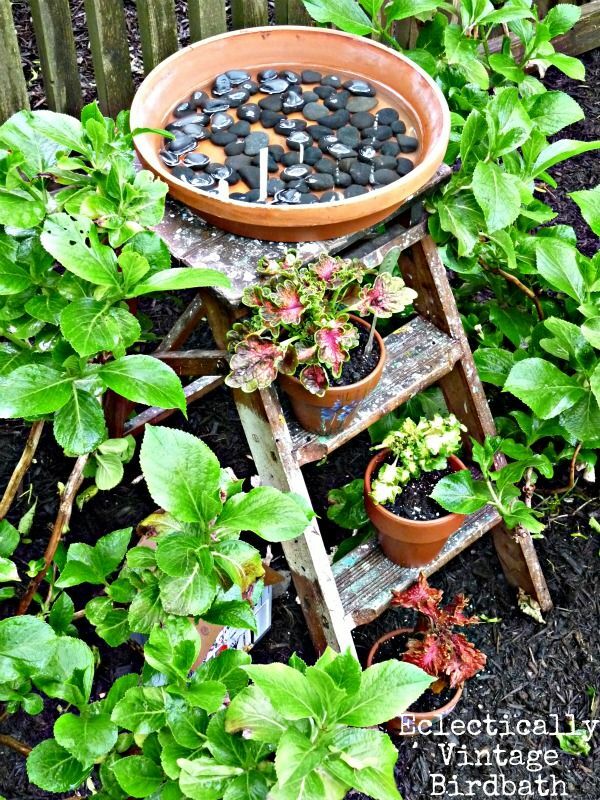 Visit eclecticallyvintage.com to find out how to make this gorgeous DIY birdbath. Feeling inspired? 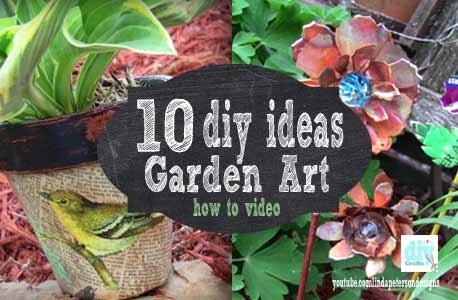 I’ve put together 10 of my favorite DIY Garden Art videos for you! These projects are easy to make and budget friendly!